Israel's military says it has started hitting Iranian targets in Syria. The Israel Defense Forces (IDF) says its operation is against the Quds Force - elite units of the Iranian Revolutionary Guards. It provided no details. But there are reports of strikes around the Syrian capital Damascus early on Monday, reports BBC. Syrian media say air defences have repelled "an Israeli aerial attack". On Sunday the IDF said it had intercepted a rocket over the Golan Heights. Syria's state-run Sana news agency quoted a military source as saying that the country's air defences shot down most of "hostile missiles". The UK-based Syrian Observatory for Human Rights (SOHR) says Israeli rockets were targeting "the vicinity of the capital Damascus". Witnesses in Damascus spoke of hearing loud explosions in the night sky. The SOHR later said the Israeli missiles destroyed weapons depots and military posts belonging to Iran and the Iran-backed Hezbollah movement. The SOHR also said there had been fatalities. 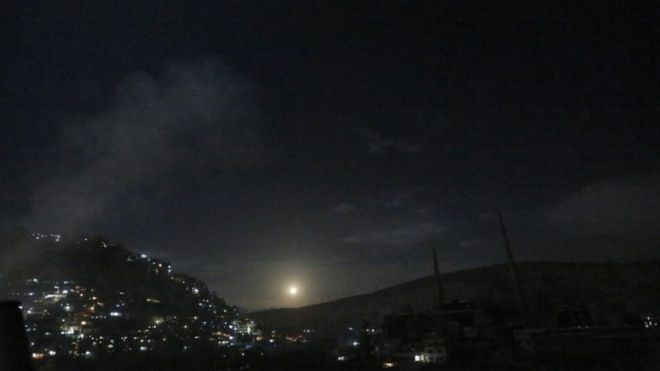 But there are reports of strikes around the Syrian capital Damascus early on Monday, reports BBC.